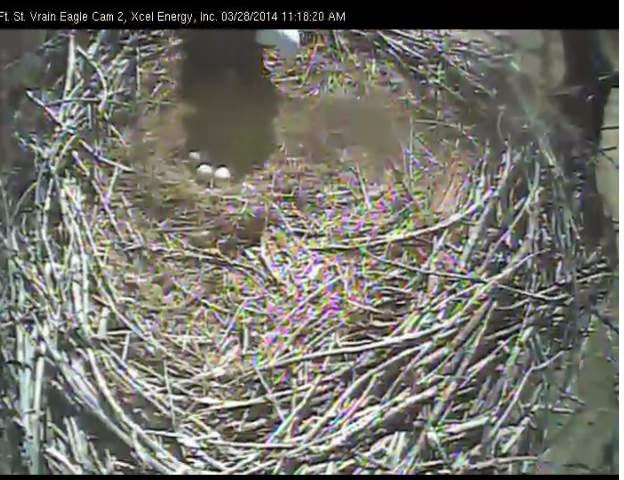 Three Bald Eagle Eggs at Fort St. Vrain! The eagles have tended to be closer to 39 days here, so the eggs should start hatching on roughly April 1st. April 1st might be a very busy day for us, since it's also the first possible hatch day in Decorah and the projected 'jump' day for Canada geese Fred and Wilma's brood at Eaglecrest, assuming hatch happens there on March 31st. When will the eggs hatch in Decorah? As several of our mods have pointed out, this almost exactly mirrors 2011. So if the hatch occurs as it did then, we should see hatch #1 on April 1, hatch #2 on April 3, and hatch #3 on April 6. However, eagle eggs can take from 35 to 39 days to hatch, and the spring of 2011 was unusually warm and dry. If we go with the 39 day figure given this year's extreme cold, hatch #1 should start on April 3, hatch #2 on April 6, and hatch #3 on April 10. 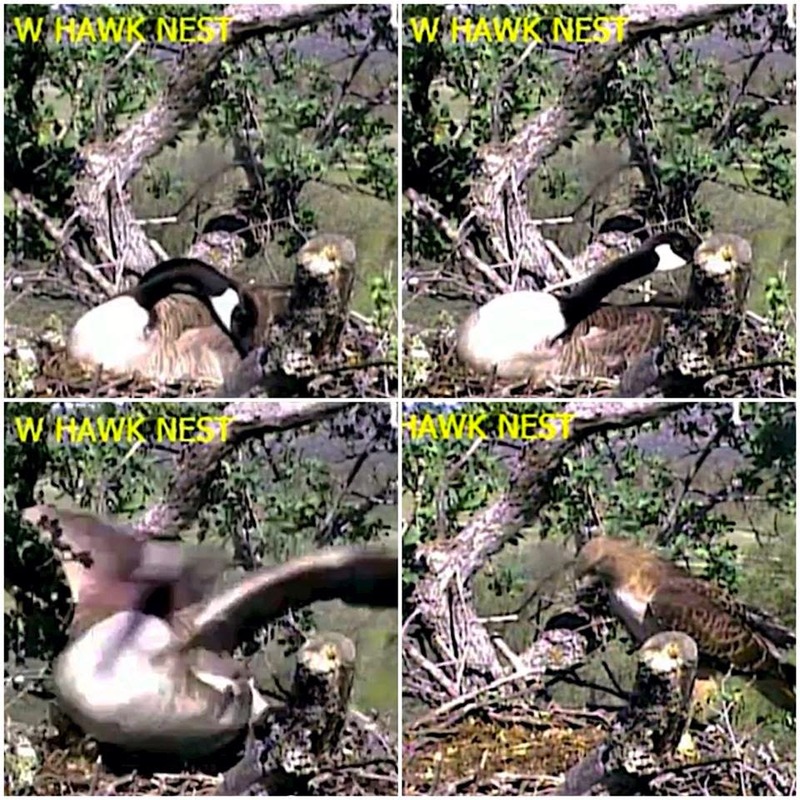 In short, we're predicting that the hatch could start any time between April 1st and April 5 based on what we know about the eggs, the eagles, and the weather. We'll be watching Mom & Dad as they roll the eggs to see if they just roll them, or if they stop and stare, looking for a pip hole or listening for a chirp from inside the shell, and offering chirps back as encouragement for the chick to chink away at the egg. The pipping process can take from 12-24 hours before the hatchling emerges. Stay tuned! Canada goose Mom Wilma is incubating NINE EGGS...seven of her own and two laid right in her nest by a female intruder. The two "foreign" eggs were laid on 3-15 and 3-22. In both cases, Wilma relentlessly attacked the intruding goose until she left. We may not have seen the last of her. The two intruder eggs will not hatch with Wilma's...they are eleven days or more behind schedule. Wilma began full time incubation of her SEVEN eggs on Tuesday, March 4th. We will expect the little goslings to hatch around March 31st...with the "big jump" about April 1st. Mate Fred is in constant protection mode, as usual. "Over half the birds assumed to be capable of breeding failed to make nests in which they laid and incubated eggs; one-fifth of the birds failed even to pair up effectively. The nine pairs that failed to lay eggs in nests were involved in unusually frequent territorial clashes, and most of them were unable to maintain stable territories for any length of time. Four of the 5 pairs (and perhaps all 5) that lost their clutches did so because of disturbance to the female from other geese, related to a lack of effective male defense." So our unknown intruder doesn't have a male to help safeguard her nest from other geese, who can be very disruptive to laying and sitting. What seems like erratic behavior is really an attempt to produce young under extremely difficult circumstances. While the intruder's eggs won't survive this spring, she'll most likely pair up with a new male goose to try again in 2015. There is no shortage of geese at Eaglecrest! Geese have an elaborate, shifting hierarchy ruled by ganders with large families. I'll write a little more about the importance of family once the eggs start hatching. To watch Eaglecrest live, go to http://www.ustream.tv/eaglecresthawks. We anticipate hatch in Wilma's nest at the end of March or very early in April. Some of what we're seeing could also be a response to crowding, which impacts reproductive and social behavior. As California's drought reduces water resources, birds and other animals crowd more densely around those that remain. We'll explore the impact of crowding in a future blog. What happened at Eaglecrest on Saturday? Why did another Canada goose sit on Wilma’s eggs for 27 minutes? Why didn’t Wilma’s mate Fred help remove the invading goose? We’re getting a lot of questions about what happened at Eaglecrest on Saturday, March 15. 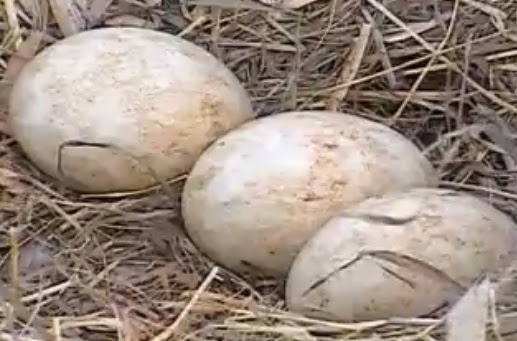 First, a recap: At 6:49PM PST, an unknown goose settled on Wilma’s eggs. Wilma spent the next 27 minutes trying to evict the invader by nibbling and chewing on her side, wings, and neck. The intruder eventually left without responding to Wilma’s defense. Wilma immediately settled back down over her eggs, incorporating the down she’d plucked from the invader into her nest. Fred didn’t attempt to drive the invader or Wilma from his nest, and there was no interaction with or harassment from other geese. So what was going on? And why didn’t Fred help? The same study revealed that egg dumpers tended to be closely related to egg dumpees. Is this a deliberate collaboration between mothers, sisters, and other closely related females, or simply a consequence of families living closely together? It’s an intriguing question and one that deserves more study, especially since family size, aggression, and social dominance all impact nest success and survivability of young. Eaglecrest’s facilitators told me that they believed the invader was a related bird – possibly a daughter – and similar behavior was observed last year as well. So was this a related adult goose looking to dump an egg in Wilma’s nest? If so, she failed. Seven eggs were counted in the nest prior to and immediately after the intrusion. Could the invader have been an immature goose? Younger geese have been witnessed engaging in adult behaviors, including copulation and pair-bonding. Bonded youngsters have been observed maintaining territory and building nests, although they don’t lay eggs. At least one observer believed this was an immature bird. If she was, it might explain why she attempted (but failed) to drop an egg. Perhaps hormonal activity (and maybe immature pair-bonding?) compelled her to try to lay or incubate eggs she didn’t have. While Canada geese aren’t as monogamous as we once thought, pair-bonding and family are extremely important in their lives. According to one study, single immature Canada geese were 1.44 times more likely to die or disappear than immature Canada geese that belonged to a family. Social status is tied to family, and family is a matter of life and death. Perhaps our invader didn't have a family or had recently lost a mate. She may have been trying to pair with Fred. Alternatively, she could have been under a compulsion. If her previous mate and nest had been largely destroyed shortly after the onset of incubation, she might have been hormonally compelled to incubate eggs, which would explain her persistence. Even more strangely, she might have fixated on Fred or the nest itself. Collias and Jahn wrote that “Subordination to dominating geese, inability to establish a foothold against the resistance of territorial incumbents, and unsuccessful fixations on certain nest sites or on certain individuals as potential mates, all serve to delay…effective breeding by many individuals.” This seems like the less likely scenario, since unpaired geese don’t usually disturb nesting pairs. But I can't rule it out, either. Maybe this kind of behavior is more common than was once believed, or has become more common as populations have expanded and increased in density. Only the geese know for sure. So why didn't Fred help Wilma? And why didn't the invading female respond to Wilma? Male geese protect their mates from a variety of things, including other male geese. Male geese have been known to kill one another over mates, harass and disrupt nesting, and engage in extra-pair fertilizations. By defending his mate from other males, Fred assures that the goslings hatch successfully and are all his. A non-aggressive, presumably unmated female was no threat to Fred's paternity or eggs. However, she was clearly a threat to Wilma, who responded accordingly. We've also been asked why the invading female didn't respond to Wilma's pecking and down pulling with hissing, flapping, or honking. Perhaps she was trying to prevent triggering an aggressive response from the larger and more powerful Fred. Similar 'quiet' strategies have been noted in Canada geese who are accompanying newly hatched goslings on their first trip from the nest. By remaining quiet, parents avoid triggering an aggressive response from other nesting geese that could damage or kill their young. It can be disappointing to find out that birds don’t necessarily model human ideals of fidelity or cooperation, especially when the birds in question have a reputation for monogamous behavior. I think professor and ornithologist Bridget Stutchbury put it very well when she wrote “There are many similarities in how competition and conflict have shaped the evolution of behavior among animals, but we must not forget that birds do not have the same feelings, thoughts, or decision-making processes as humans.” I look forward to seeing what happens once the nests start hatching. 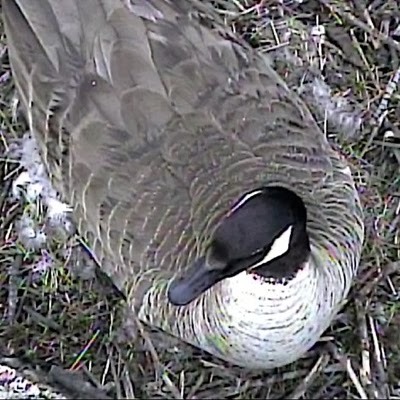 Three Canada geese at Eaglecrest are currently sitting on eggs. "Wilma", in the home tree, has laid seven eggs to date. She started full incubation on March 4th, which puts her hatch between March 27 and March 31. Betty has three or more eggs in the east pond nest, and Lucy has two or more eggs in the elevated pond nest. The most common question about Eaglecrest's Canada geese is probably "How will the parents feed so many young?". While large broods are fairly common in many kinds of birds, Canada geese don't have to feed their young. Read on to learn more! From Stanford University: A precocial bird is "capable of moving around on its own soon after hatching." The word comes from the same Latin root as "precocious." Altricial means "incapable of moving around on its own soon after hatchling." It comes from a Latin root meaning "to nourish" a reference to the need for extensive parental care required before fledging in altricial species. So what's the big difference? Precocial birds like Canada geese lay energy-rich eggs to support the greater in-egg development of their young, who hatch ready to go. Their large, energy-rich eggs may contain almost twice the calories per unit weight than the eggs of altricial birds, which means that precocial females must obtain abundant food resources before laying eggs. Altricial birds like bald eagles, barn owls, and peregrine falcons do not have such large nutritional demands before egg-laying, but they have to find sufficient food once their helpless young hatch. While individual precocial birds are vulnerable to predation, it is much less likely that an entire brood will be eaten or destroyed. Altricial young cannot leave the nest prior to fledging, while precoccial young leave the nest quickly and have some ability, even when very young, to avoid predation. Stanford University also tells us that there seems to be a trade-off in bird brain sizes related to the the degree of precocity. Precocial species have relatively large brains at hatching, but their adult brains are smaller relative to body size (the brain/body-mass index) than those of altricial birds. While altricial young hatch with smaller brains, they have highly efficient digestive tracts and a rich, parent-provided diet. Post-natal brain development is great and adults have proportionally larger brains than precocial species. Is this because they have more energy available to grow larger brains, or is something else going on? We're still trying to figure it out. This abstract hypothesizes that delaying brain development (by lengthening childhood) gives brains a longer period of time to grow and become more complex: http://goo.gl/sNw3xe. At any rate, our hatchlings face very different challenges. Precocial Canada geese are relatively mature and mobile from the moment of birth, unlike altricial Bald eagles, Barn owls, and Peregrine falcons. Eagle, owl, and peregrine parents bring food into the nest for their young, often caching or storing prey for later consumption. Their young don't need to leave the nest or procure food until they fledge. The young goslings leave the nest within 24 hours of hatching and do not return to it. While their parents continue to provide protection and care, the goslings feed themselves. The precocial goslings are also able to thermoregulate right away, unlike the eaglets and owlets. Altricial birds require their parents (or a parent) to apply warmth until their down feathers are developed enough to insulate them. The eagle parents and mother owl will spend a great deal of time huddling over their young after they have hatched, but the Eaglecrest geese will take to the water quite quickly, with no huddling required. Eaglecrest offers a plethora of wildlife, including Canada geese, for watching. Visit http://www.ustream.tv/eaglecresthawks to see them! Again, we are anticipating goose hatch some time between March 27 and March 31. Why are the eagles off their eggs? Will the eggs survive? What happens during incubation? These are just a few of the questions we get about incubation. I'll see if I can answer some of them here. An infertile chicken egg. See the blastodisc? Unlike most birds, chickens will lay eggs even when a male isn't present. We'll start with a quick look at an unfertilized egg, pictured at right. From the Chicken Chick: An infertile egg contains only the hen's genetic material, which means a chick can never hatch from that egg. The hen's genetic material, termed the blastodisc, can be identified on infertile eggs as a light-colored dot with irregular borders. Every egg contains a blastodisc. My breakfast, at right, is an infertile, organic, cage-free 'Egg-Land' chicken egg. The blastodisc can be seen in the center of the egg. If the egg is fertilized, the blastodisc turns into a blastoderm - the first stage of embryonic development. End stage? Hatchling bird! Let's assume we have a fertilized egg, discussed here. 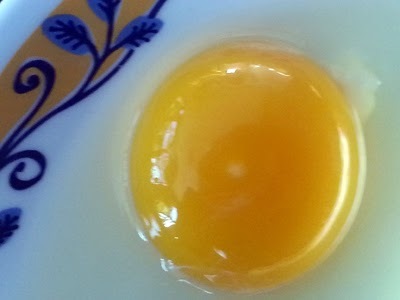 As the embryo develops, it will consume both the fatty egg yolk and high-protein egg white. By the end of day two, our little chicken will have a heartbeat. Its beak and egg tooth will begin to form on day six, and its feathers on day eight. By day nine, it will begin to look somewhat like a bird, and its mouth opening will form. On day thirteen - well, just go look at this blog for the rest. So what does the developing embryo need to survive? We discussed the importance of temperature here, but incubating birds (or incubationist humans) also need to control humidity, move or turn the eggs, and make sure the eggs are well-ventilated. Why were the eagles off the eggs so long on March 7th? We were asked this question on facebook, ustream, and via email. I think the eagles may have been giving the eggs a chance to dry out and breathe. A bird's eggshell has thousands of tiny pores, which allow water and gas to pass through. Mammals like us get oxygen through an umbilicus, but developing birds receive oxygen and remove carbon dioxide through the egg shell. Gases, including oxygen, enter and leave the egg by diffusing through the pores in its shell, across the outer and inner shell membranes, and into the blood in the capillaries of a special tissue called the CAM, or chorioallantoic membrane. As the weather warmed in Decorah, the snow began to melt and the humidity soared. Condensation can form on eggshells exposed to excessive humidity, which clogs shell pores and provides a vehicle for bacteria. The result? Fatal suffocation and/or contamination. Only the eagles know for sure, but I think they may have responded to the threat of rising humidity levels by leaving their eggs uncovered. Standing or leaving entirely allows fresh air to circulate over the eggs, dropping the humidity level and giving the developing embryos fresh air. Turning or rolling assists air exchange, helps maintain an even egg temperature (especially in big egg piles, where outer eggs may be cooler than inner ones), and keeps the developing embryo from sticking to the eggshell. In short, most bird eggs require specific temperatures, proper humidity, regular movement, and air exchange. Birds provide these by applying body heat, standing and/or leaving for periods of time, and rolling or turning their eggs. In birds, incubation is both an instinctive and learned behavior - while birds will automatically incubate eggs or egg-shaped things, they get better at incubation with experience. There are no guarantees, but Mom and Dad are skilled incubators with a long history of brooding together. Watching them meet the challenges of their environment gives me hope for their eggs. Go eagles! The Chicken Chick. This is a really neat site for those of us who love chickens! Brinsea. For all your incubation needs.